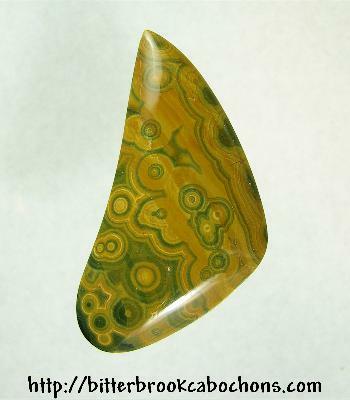 I have lots of this green-and-yellow Ocean Jasper in my pile of slabs, but I haven't cut much of it. I used this cabochon as a class demonstration of how to cut a concave side. Very nice uniformly colored orbs. It looks dull in the photo, but it really has a nice polish. You'll like this one! 45mm x 24mm x 6mm. Weight: 44.90 carats.